Being sick and teething has got to be hard for a little boy. Q, my one year old has been having a hard time lately. It is no wonder that he had lost his appetite for a couple days, choosing to only take nibbles of various food rather than eating a proper meal. The entire household was sick and I figured we needed something to comfort us and warm our bellies….soup! Q loves things with flavour and I discovered his love of garlic when I made this soup a few months ago. 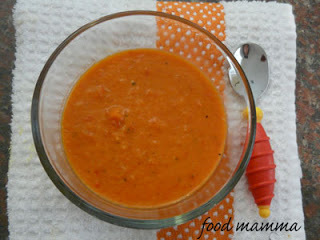 Roasted peppers, onions and garlic combined to make a chunky (or velvety, if you prefer) soup. 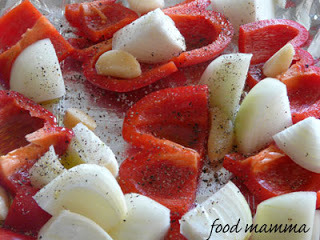 Drizzle the pepper, onion and garlic with oil, salt and pepper. Roast in the oven for approximately 15 minutes at 400 degrees. Blend the roasted veggies in a blender and place in a pot. Add chicken broth until you get the desired consistency.